Mon-Fri 7:00am - 7:00pm, Sat 8:00am - 5:00pm, 24/7 Call Center! As an established pest control company with thousands of local customers, we are the safer approach to pest control for your home or office. Other pest control companies do not have access to our proprietary NatureLine™ products and processes. Don’t take chances with your health or the health of your family or pets. Request a free inspection online, or call 1-877-662-8449 to schedule one today. A huge construction project nearby stirred up an incredible number of rats in the dead of winter, and of course the rodents wanted safe, dry places to live. Human houses! What else? In our case, we could hear them in our walls and ceilings, and we found droppings and nest-making evidence in the attic. We started with two other pest control outfits, and their efforts at trapping helped a bit, but not enough. We feel lucky to have found All Natural because they have the professional know-how, the energy, and the attention to detail required to actually win this war. A really nice man -- a biologist!-- from All Natural spent an entire day sealing off our house to prevent rats from entering. He found openings the other two outfits had missed. After All Natural arrived, the noises stopped almost at once. No kidding. In case of pest problems in the future, All Natural guarantees to help us over the next year. We recommend this company without reservation. My technician found an envelope of money in the bushes that was left for me by someone that is buying a car from me and I was renewed in the honesty of humanity. Please let him know that I appreciate him. Thank you. If you get rid of these ants I will be extremely happy. All the other work we had done was done on time and neatly. Very happy with results. Everyone I have met has been prompt, friendly and professional. Nice not to have to worry about ants coming in the house. Each person we have dealt with has been professional, informative, and has listened to our needs. We appreciate that they will stick with us for a entire year and make sure our rodent problem is solved to our satisfaction. I"ve had All Natural for a year now. The technicians are amazing. A shout out to Chris who was very professional and knowledgeable. I would request him to come because he knew my home and offered suggestions and advice. Thank you, Chris for your help. Communication with the scheduling of appointments is still an issue...you can"t have people waiting for a four hour window and no one comes! Overall, you guys are awesome and I would hire you again! Thank you for all your help. You all are the best!!!❤️. Jeremy and Ray have been great. We look forward to the program and its benefits. Thanks! Was very pleased with Greg and the promptness of them following up on my email. He then scheduled a tech to come out same day to start the process. Great job. The entire team is responsive and very professional. We discovered rodents in our crawl space, a situation that has taken several visits to completely address. All Natural's team has had our back all the way along. I have been a very satisfied client for several years. Thank you so much for your prompt response and top quality service! This is a very efficient, caring and informative company. I would recommend them to anyone . They know there stuff folks . We have been dealing with rats in the home , destroying everything in their path and this company took care of business!!!!!! Thank you very much !!!!! I can sleep now !!!!! So far I am hopeful that the ants will be gone. The technition, Ray, is outstanding. He goes way above and beyond to find their nests. Thank you. Very polite and hard working. Trustworthy. Explained everything to me and answered all of my questions. I would recommend company to any of my family or friends. All-Natural has been at my house on many occasion fulfilling the contract for pests and bat control. I've had two service technicians (Jack and Cody)do the work. They arrive when they say they will arrive. They are respectful; and pay close attention to the customer's questions and needs. I will definitely recommend All-Natural to my friends and neighbors. Thank you very much for fantastic service. The staff are all very courteous and helpful. They explained everything sometimes twice so I would understand the process. Haven’t had any problems with rats since they treated. They said they will come anytime I hear, smell, or see any rats or mice. Very conscientious folk who care about their customers!! I appreciate your response to my bee issue.I am deathly allergic and tried to go out the front door only to be pushed back by at least a dozen bees. I feel your salesman was misleading in his "pitch" . My understanding was if we didn't purchase the $1,500 package, we had one application with no further recourse. Thanks to the general manager and the technician, both were professional and timely in their response.I feel we are now safe in the yard again. We are very grateful. They never give up on eliminating whatever our issue is during each season. Ray did a very thorough job. He made sure we were happy with every phase of the job. Quite pricey, but if it works it will worth the money. Terry and Susan, Eugene. They are always a delight to work with, they are very knowledgeable and communicate well, and they get results. I highly recommend them. I am happy, mostly. My husband got his 4the yellow jacket sting in a month on Saturday. I do understand it’s not your fault but still. Paying you all a lot of money. Found a spider on Sunday in my dish drain. Not sure what more I can do. Also the screen around the deck. It wasn’t finished as well as it started. 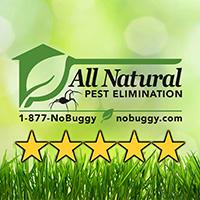 The service I have had from All Natural Pest Elimination has been excellent.They come to check on my house regularly and I can call them if I need them at other times. Corey came out and donned his suit and crawled under the house with hornets swarming all over! When he came out, there were just a few and 20 minutes later, barely a one. The next day, all gone. Nothing. His work was great!! Always pleased with the results of this service. I have had a very good response and excellent service to eliminate the wasp problem. However, the price is way out of line. I paid it because it was an emergency situation. $445.00 for a one time fix it is very much more than we would have paid with Terminix. Is this your usual rate, or is it because of another reason? We will not call again. Great company to work with. Techs who came to my house were very helpful. I feel like they really care about the care taken to protect my home. All interactions have been positive and I would absolutely recommend this company to a friend. Ray has been doing a Great Job! Good to come quickly when called... the company sold to a employee a few years back....has really stepped up since that time.. call several times a year to ask about coming out for checkouts.. Although our overall experience was pleasant with both the sales rep and the tech who did the job, there were some things that could have gone better. We were told that in order to treat the studs, there would be holes drilled in the side of the house and that we could have it done on the inside as well. We were not told that if we had stucco siding, there was no option but to do it on the inside. The tech was unaware that the outside of the garage was to be sprayed as well. He looked at it and said that he could come back if we wanted. Have some things in the rafters of the garage. He did a good job in the attic and we believe to be protected. I do not recall that he set a rodent trap in the attic. If the work order says he did, then he did. All in all, this was a very good experience and time will tell if it is effective. All Natural’s service and results have been so great at my home for the last five years that I also just hired them for my rentals. No bugs in the house and no poison near you or on your planet. The employees are all very nice, too. Now that’s winning! When the techs arrive they are always ready to get the job done. They are polite and professional. They answer all my questions. All Natural Pest Control always responds quickly and efficiently to my calls. Every thing you told me you were going to do has been done and there are no more bugs. Thank you. Have liked your company from the start - the men who come to inspect and spray are great. My only complaint is the frequent calls from the office for "check ups". When I need you I will call you. I am sorry but I blocked your number on my phone because it was driving me crazy with calls when I didn't want to be bothered. I worked in an office for 25 years having to answer telephones while working and believe me, I do NOT talk on a telephone much, nor do I want to hear it ringing. Hope you understand. around nice people. Five stars. Been with them for years and will continue for years to come. Good response time from initial call. Good feedback from technician after service was completed. Very knowledgeable; very thorough; very professional. tech did a fantastic, complete job - no more bugs! !